Sing reminds of why Illumination Studios is one of the best in the field, giving Disney and Pixar a run for their money. Fifteen years ago, a little singing competition show aired on television and captivated our hearts. Each year, we would watch intently as hopeful young adults put themselves and their vocal talents on display on a show called American Idol. Other shows soon followed. Some, such as The Voice, are still on the air and show no sign of going anywhere, so it was only a matter of time before a singing competition got the animation treatment. SING came to theaters this past December and, now, it is coming out on 4K UHD, Blu-ray and Digital download. Ever since Buster Moon (Matthew McConaughy; Dallas Buyers Club) was little, he dreamt of owning a theater and producing lavish shows. When he got older, that dream became (mostly) reality, except the shows weren't so lavish and he couldn't pay the bills. He decided to give it one last try with something new… a singing competition. However, when the flyers for auditions went out around town, they attracted some fantastic talent but they also had a major typo on the prize. When the flyers for the singing competition when out, it caught the eye of several people (animals) who thought this was their shot to make it big and earn a great monetary prize. There was Rosita (Reese Witherspoon; Walk The Line), a housewife and mother of 25 piglets, Mike (Seth McFarlane; Ted), a talented mouse and swindler looking for the $100,000 prize money, and Johnny (Taron Egerton; Kingsman: Secret Service), an ape who is desperately trying to not follow in his father's footsteps and join the family business of crime. There is also Meena (Tori Kelly) and Ash (Scarlett Johansson; The Avengers), two very different teenage girls both going through own struggles. With no real prize money and, eventually, no theater either, these hopefuls and Buster Moon make their dreams a reality and perform to great applause. When I first saw the trailer for this film, I will admit I cringed a little. An animated movie about animals that are humanlike and enter a singing competition seemed lame, to be honest. I didn't exactly have high hopes for the film. Luckily, I was somewhat wrong. The movie was cute and fun and entertaining. The plot was fairly fleshed out and each character had a storyline that, while clichéd, was whole nonetheless. The cast is one of the better parts of the movie, as they are not only talented actors but they have terrific vocals as well. Egerton was a surprise vocally and Kelly in her first role lends her amazing talent, which gives the film an air of authenticity. Witherspoon was great and McFarlane uses his voice for more than making weird voices. McConaughy is the only one who doesn't sing but his Buster Moon is part used car salesman part dreamer and he makes Buster likable, even though you're not sure you're supposed to. I also have to give special mention of Nick Kroll and his German dancing pig Gunter – they are scene-stealers every time. While 4K has a tendency to make special effects look fake and cheesy, the same can't be said for animation. The 2160p picture quality is phenomenal and enhances one's viewing pleasure immensely. The colors are well represented and pop off the screen. The Dolby Atmos audio is terrific, as well, which only serves to emphasize a terrific soundtrack that is upbeat and fun. The combo pack offers several extras including three mini movies – Gunter Babysits, Love at First Sight and Eddie's Life Coach and a making of the Mini movies. All are pretty cute and the "making of" is a quick insight to making animated short films. The other extras are The Making of Sing; Finding the Rhythm: Editing Sing, which is a pretty interesting look at the choices they make in editing the film, character profiles that include interviews with the actors who voice the characters, Music videos and making of the music videos for some of the music in the film and a feature called the Best of Gunter that highlights the crazy pig. While neither original nor spectacular, Sing reminds of why Illumination Studios is one of the best in the field, giving Disney and Pixar a run for their money. The music is infectious, the characters diverse and loveable and the plot is good enough for the PG set. I'm still a minion fan but I say give these talented animals a shot, you won't be disappointed. 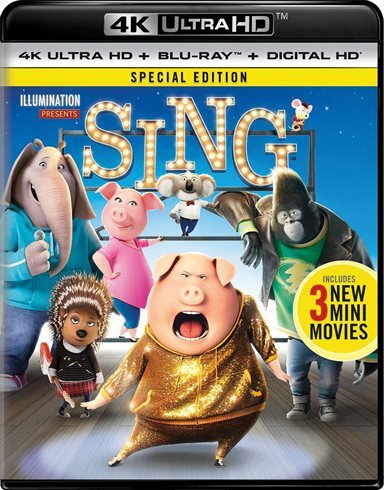 Download Sing from the iTunes Store in Digial HD. For more information about Sing visit the FlickDirect Movie Database.